There are many items to choose from in TDE Browser adventures. When you create a hero, she is automatically equipped with a weapon and some armor as appropriate for the chosen Archetype. After you have begun playing, you should take a look at your hero's equipment. Maybe she already has more than one weapon, possibly even a shield. Some Archetypes even start play with a healing potion in their Inventory. Use this one sparingly, though - for once you have emptied it, it will disappear from your Inventory. If your hero carries more than one weapon, you may choose which one to wield. Be aware, though, that changing weapons usually also leads to changes in combat values. We have classified the weapons of Aventuria into various types, each of them corresponding to one specific Combat Talent ». Your hero has Talent Prowess in each of these, with the points being divided between Attack » and Parry ». Thus, if your hero wears a particular weapon, you should pay close attention to the associated Combat Talent (type), making certain that your hero's TP with this Combat Talent is as high as possible. HP: Hit Points; "1d" means the roll of one six-sided die. If a weapon is listed as inflicting 1d+3 HP, it inflicts between 4 and 9 points of damage on a successful hit. HP/ST: When using a weapon in melee, exceptional Strength allows you to inflict more damage with this weapon than would normally be possible. The relation between high Strength and additional damage is a function of the weapon's type: high Strength works better with cutting and blunt weapons that with piercing ones. Thus, each weapon has been assigned two values: a Threshold Value listing the Strength a hero needs to wield the weapon in question in a 'balanced' way; and Damage Increments telling you how many additional points of ST your hero needs to do an additional hit point (or even more). Thus, a TP/ST listing of 11/4 means that your hero does one additional point of damage if her Strength is at least 15, two additional points if her Strength is at least 19, and so on. If, on the other hand, your hero's Strength is 7 or lower, she would inflict one TP less, and in this case, both AT Value and PA Value would be reduced by 1. Wt: The weight of a weapon in ounces. One ounce is equivalent to 25 gram (in reality). BP: All weapons and shields are provided with a Break Point indicating how easily the items break in combat. Tests for breaking are required when a Critical Hit occures or a Called Attack (i. e. Mighty Blow) of 10 or more is parried. 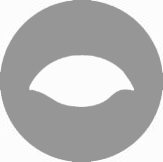 2d6 will be rolled automatically. If the result of this roll is lower or equal to the affecte weapon’s or shield’s BP, the item breaks. If the result exceeds the BP, the item remains intact but its BP Value is increased by 1 point. An armorer can repair weapons and the BP will be reduced to its origin value. INI: Some weapons provide their wearer with advantages in gaining Initiative », by being easy to handle or having good reach. On the other hand, weapons with very short or very long reach, or very unwieldy ones (also called, unbalanced weapons) will actually lower your Initiative. WM: Weapon Modifier. The first value modifies AT-Value », the second value modifies PA-Value ». Length: The length of a weapon in centimeter. Attack and Parry can only be converted if the weapon is lower or equal 2 meter. TDE Browser adventures do not use Distance Classes or other optional rules items you may have come to love from playing the pen-and-paper version of TDE. 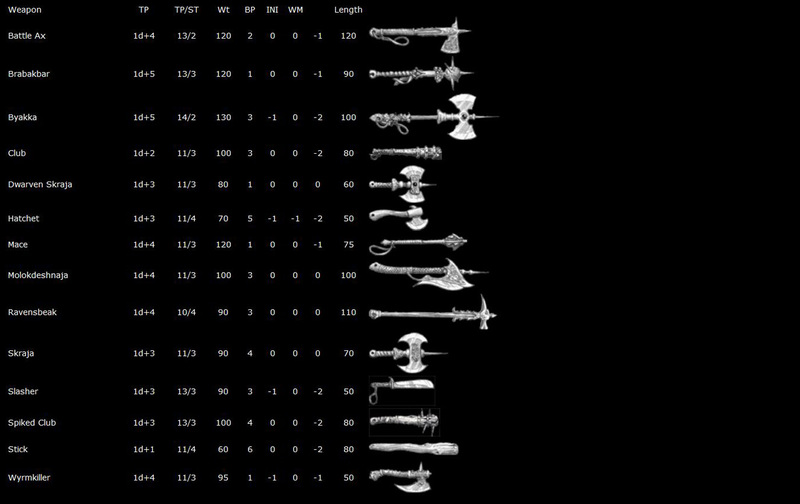 Neither do we allow the option of using certain weapons with different Combat Talents than the ones listed here. The list below gives you all the weapons that are available in the game, each within the context of its respective Combat Talent. 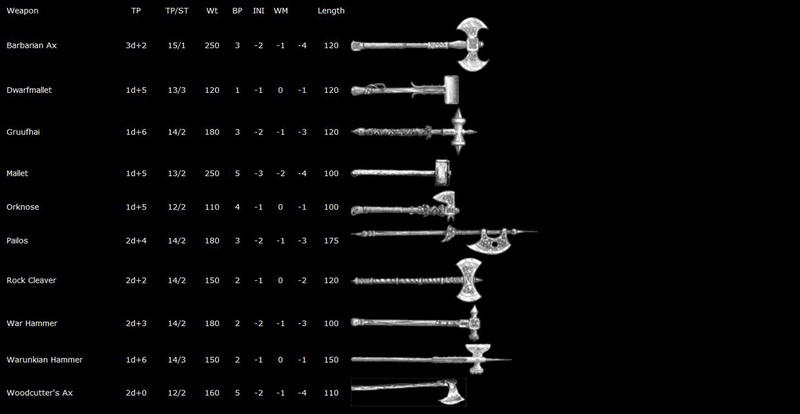 Axes and Maces: This category comprises two types of weapons, both of which do damage mainly by the sheer force of their blows. First, all types of axes consisting of a heavy, broad blade fixed to s shaft doing damage by combining force of blow and sharpness of blade (or double blade); second, blunt weapons intended to concentrate crushing, bone-breaking damage in one single area. These are usually quite heavy and sometimes equipped with spikes to be more effective against armored opponents. Maces, cudgels, and war hammers belong in this group. Chain Weapons: Chain weapons consist of a heavy weight fastened to a wooden haft by one or more chains (the length of which is almost that of the weapon’s haft), often made more dangerous by adding thorns or spikes. It is somewhat hard to parry attacks with chain weapons; then again, it is also quite hard to parry attack made with chain weapons, since they may be used to strike past shields, making them a lot harder to parry. Because of this fact, Chain Weapons ignore the PA-Bonus given by shields, and can not be parried by Daggers and Fencing Weapons, all other weapons get a PA -2 malus. Chain Weapons also don’t allow delicate maneuvers themselves. Therefore it is not possible to convert attack or parry. A Fumble may take place already by throwing a 19 and 20 at AT or PA. (Regularly only by a 20.) The Fumble may be prevented by an additional AT- or PA-Test. Morning Star gets a -2 malus, Ogerslap -3, and Oxherd -4. An Ogerslap requires a minimum ST 15 to be wielded, an Oxherd a minimum ST 16. Daggers: This category covers all bladed weapons that are used for piercing attacks, and that are limited as parrying weapons, of no more than two spans in length (except the Armor Piercer). Daggers almost invariably sport a straight blade sharpened on both sides. Infantry Weapons, Chain Weapons, Two-Handed Blunt Weapons, and Two-Handed Swords can not be parried with this kind of weapons. Fencing Weapons: These are weapons with especially thin blades and slender tips with a length of no more than one pace and richly decorated hilt baskets, parrying guards or artfully ornamented parrying handles. Fencing weapons are both elegant and fast. They are regarded as fashionably "modern" by some, and as "silly fool’s weapons" by others. Chain Weapons and Two-Handed Blunt Weapons can not be parried with Fencing Weapons. Hand-and-a-Half Sword: These weapons usually need to be wielded with both hands. Despite their tremendous weight, such swords allow for displays of swordplay almost like fencing weapons, which is why skill with hand-and-a-half swords is often regarded as the pinnacle of sword-fighting. Infantry Weapons: These weapons consist of a short blade fastened to a long stick of wood; the blade may be used for both cutting and thrusting. Sometimes these weapons are also equipped with hooks, to pull down enemies. All of these weapons need to be wielded with both hands. Thus it is not possible to also use a shield. Sabers: These weapons sport a sharp edge at one side of the blade (and often a pointed tip). As opposed to swords, they are used for cutting an only rarely for thrusting. This category runs the gamut from short cleavers to elegant cavalry sabers to heavy, almost axe-like weapons. Spears: As opposed to infantry weapons, spears are employed for thrusting only, with the blunt end being reserved for parrying. All spears need to be wielded with both hands. Thus it is not possible to also use a shield. Staves: Even a simple wooden staff of no more than eight spans in length may be used as an effective weapon, if in the hands of a skilled master – usually, though, quarterstaffs are not "simple wooden weapons" but specially hardened ones, wound with metal bands, or even fitted with blades on both ends. Staves need to be wielded with both hands. Thus it is not possible to also use a shield. Swords: Swords are bladed weapons ranging from 0.5 to 1.25 paces in length, about three-quarters of which go to the bilaterally sharpened blade. Swords can be used for both hitting and stabbing, while their parrying guards even allow for complex defensive maneuvers. Two-Handed Blunt Weapons: These weapons (which, despite their monicker, do sometimes have sharp blades, but never sharp tips) need to hit their target with the utmost precision to do the optimum amount of damage. If the head of the weapon misses, the haft does next to no damage. These weapons cannot be used for thrusting and stabbing, nor are they effective as parrying weapons. You may not use a shield while employing one of these. Two-Handed Swords: This Talent covers all especially long bladed weapons which are primarily used for cutting but may also be used to thrusting in short-distance combat. You can even parry with them, but may not also use a shield while wielding a two-handed sword. The TDE combat system has very detailed rules for using thrown as well as missile weapons, offering a multitude of ranged weapons in the process. However, incorporating these into a TDE Browser adventure is about as difficult as to allow the use of magic, since the many possibilities open to heroes equipped with such weaponry are well beyond the scope of a text-/grafic-based Browsergame. Thus, we have not made any provisions for missile weapons whatsoever and have severely limited the use of thrown weapons. Whenever thrown weapons enter play, this is handled via the Throwing Knives Talent. We do not use the rules for Range Increments and Hit Point additions or reductions due to range. If you really need to know, the maximum distance you can throw any of the weapons listed below, if they may be used at all in a TDE Browser adventure, should be around 15 paces. Throwing Knives: Knives and daggers are the most common thrown weapons throughout Aventuria. However, not every knife or dagger is suitable for throwing. Only those weapons that have been especially counterbalanced and have a light-weight handle can be used properly for throwing.